Typically, progressive Christians use Scripture in ways that are informed by critical scholarship, as well as holding more inclusive views about the nature of their own faith and the spiritual dignity of other faiths. The Mel Gibson movie, THE PASSION OF THE CHRIST, has been heavily promoted as an evangelistic tool for use by conservative Christians. The film has alarmed some people by its failure to reflect contemporary biblical scholarship, as well as for its potential to incite anti-Semitism. This page is intended to serve as a gateway to online resources that reflect on the significance of THE PASSION. Suggestions for new links are most welcome. Gibson's film is manna from heaven for those who are heavily into (a) literal acceptance of the Gospel narrative, or (b) the blood atonement theology. In the end, as his own words indicate, Gibson chose to depict the passion of Jesus to fit his own beliefs -- after all, he was paying the $M25 bill -- and ignore the fact that historians are (at best) divided over the character and meaning of the NT accounts. 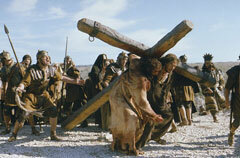 None of that ambiguity is expressed in his film, which depicts a very traditional version of Jesus and his death. As a great many pious believers do -- and not least among the clergy -- Gibson chose to exploit the genuine differences of opinion among the experts as permission to believe whatever he wishes. This turns out to be not much different than what his Sunday School teacher (or the RC equivalent) told him as a child! What THE PASSION ignores -- and most likely does not even realise -- is that there was (and is) much more to Jesus than his death. Similarly, the mainline churches' eucharistic prayers and creeds suffer from the same defect when it comes to appreciating the sacred significance of Jesus' whole life: his 1C Jewishness, his words, his actions, his faithfulness in the everyday-ness of life, etc. The cross was the ultimate expression of that on-going faithfulness to God's call upon Jesus, not some isolated event that is best interpreted apart from his whole life. If you are interested in teasing out some of the wisdom for today that is largely overlooked in other places where the "dangerous memory of Jesus"* is kept alive, you may wish to check out the HODOS online community. * This evocative phrase comes from Elizabeth A. Johnson. William Safire, "Not Peace, but a Sword"
Mahlon Smith, "GIBSON AGONISTES: Anatomy of a Neo-Manichean Vision of Jesus"
A comprehensive theological review of the film with lots of links to other resources.